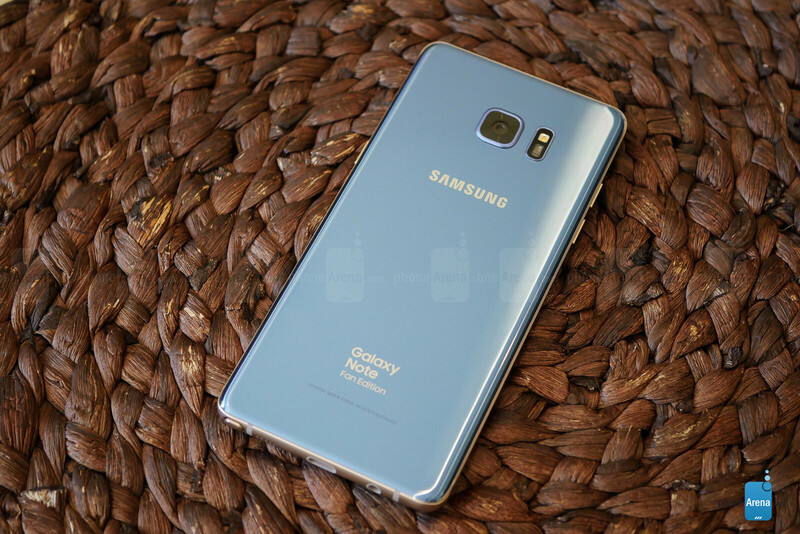 The Samsung Galaxy Note Fan Edition needs no introduction. In fact, no device we can think of has garnered more visibility while its actual release was so limited in size and scope. 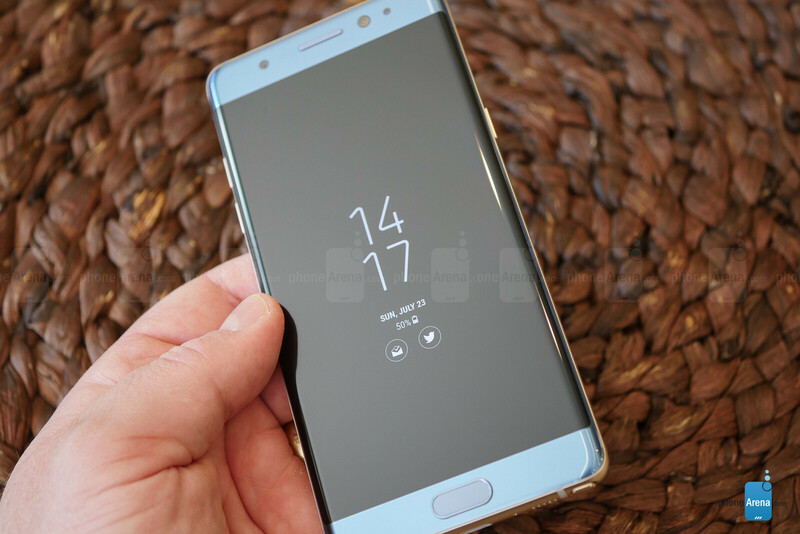 The Galaxy Note FE could arguably be tagged as a simple reincarnation of the Note 7, and that is certainly a valid observation. Samsung chose to refurbish a large selection of returned devices. Using salvageable components from the beleaguered Note 7 series, Samsung was able to reduce gross waste, and even extract materials that could be put to use in other products. During the time that was taken to tear-down, reclaim, and recycle all the returned stock, Samsung continued to make progress with its other smartphone products, particularly with its flagship Galaxy S-series. The end-result, by making only two significant changes, Samsung made something that is actually a little more, and a little less, than what the Note 7 was. The Note FE has the exact dimensions and physical design of its predecessor, making it a two-handed device. The only visual cues that this is a different model are the lack of the Samsung logo under the earpiece, and the name of the device on the back. Outside of that, even though it is “last year’s” design, the Note FE feels great in the hand, and the symmetrical motif with the sharp curves in the display and rear glass back plate blend nicely into a subtly noticeable metal frame. In all, the design fits nicely into what we have seen so far in 2017. 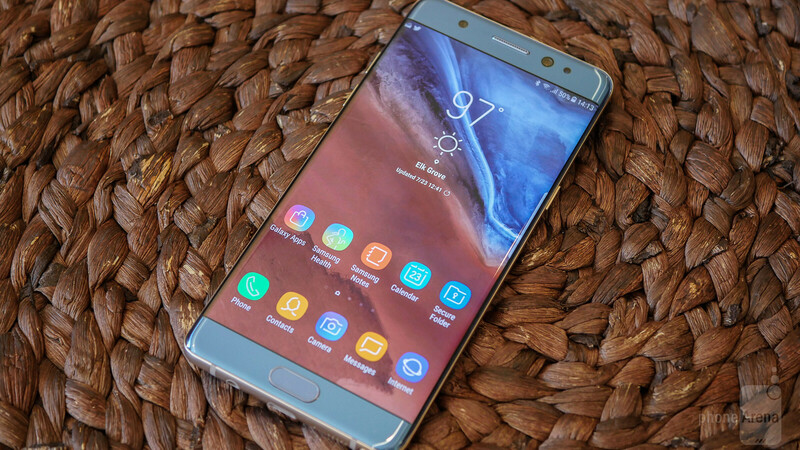 The color options for the Note FE are the same as was available last year, black, silver, gold, and coral blue, with the latter still among our favorite color schemes, the light blue touch contrasts perfectly with the copper metal frame. Design features are otherwise unchanged from last year, due to the remanufactured nature of the Note FE. That is not a bad thing, the materials are all top notch, Gorilla Glass 5 protects the display and backplate, and water resistance is still present, with the Note FE packing an IP68 water and dust resistance rating, allowing the device to survive up to 30 minutes in as deep as 5 feet of water. With 2K resolution, the Note FE carries on with Samsung’s penchant for making vivid AMOLED displays. Though, the 16:9 ratio is arguably an outlier among flagships this year, the arrangement makes sense for a device with a suite of functionality baked-in to utilize the S-Pen. Even with momentum of big-ticket video media making the push to a narrower aspect ratio, like 2:1, the 5.7-inch has plenty of room to let you take it all in. With the new Samsung Experience UI, the resolution is set to FHD by default. In addition to kicking the pixels into high gear at 1440 x 2560, you can also opt for the more battery and processor friendly HD of 720 x 1280. That noted, users will be able to discern subtle differences in UI fluidity when changing resolution settings, but after the initial switch, you still have to look closely to really see the difference overall. In addition to being able to swap through resolution settings, Samsung lets you switch between different screen modes that adjust the color characteristics of the display. The default setting is “Adaptive display,” which tends to bring you all the color, indeed, saturation is pretty high, maybe too high for some users. “AMODEL cinema” places the display in a mode suitable to playing HDR10 video. “AMOLED photo” puts settings in the Adobe RGB color space, and “Basic” places colors in the standard sRGB scheme, which is arguably the best option, but beauty really is in the eye of the beholder. On this unit, the “Adaptive display” pumps up all the color to “11,” while “AMOLED photo” seems to deliver the best all-around balance. Prepare to get ambush with that review. The Fiery Edition Note 7. "Graphics performance can stutter sometimes" So, the phone lags. I don't care what any biased Samsung fanboy says, but this is unacceptable. This was mentioned in the S8+ review as well. Samsung must figure out a way to fix this issue. The FE is far too expensive to stutter when gaming. My 6P from 2 years ago doesn't do this, and it has a weaker chip. 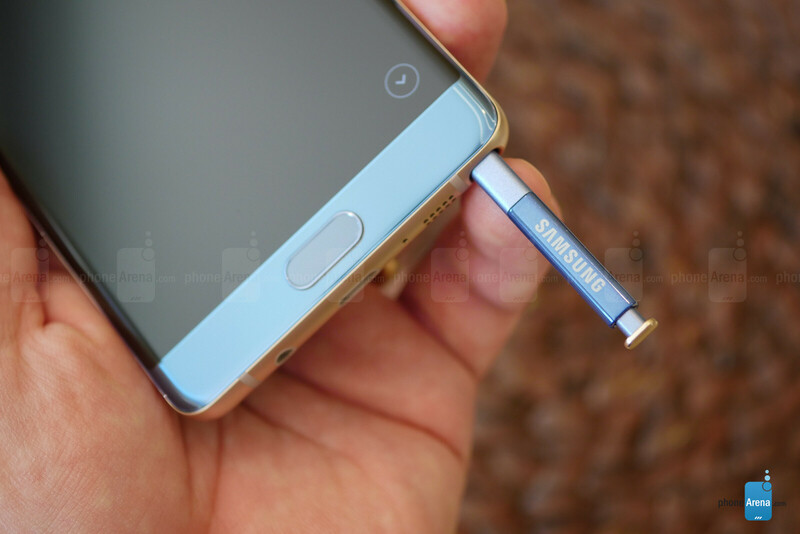 Samsung - We want to love your devices, but real world performance must be improved. iPhone 7 doesn't have a lag issue. Also, let's not deflect. All phones lag at some point. My iPhone 7 does sometimes, but it's nothing major. But he's not really deflecting anything. Every time you point out the lag issue, they deflect by swinging shots at Apple. I believe some PA posters are literally paid Samsung reps. I don't know how many times I must explain this simple concept. All phones lag. Some phones have a greater degree of lag. Some phones have such a great degree of lag in which it's declared an issue. If a review notices lag/stutter, there is most likely an issue as this observation has been tested in various scenarios. Multiple reputable sources mention gaming lag on many Galaxy reviews. This is an issue, not just the phone lagging in one occurrence. Samsung was caught in the past for paying people to write bad reviews of the HTC One and had to pay a fine. I don't doubt any second that these Samsung fans here are paid by Samsung. It continues to baffle me how much people rag on the site, writers, review scores, other commenters, yet come back regularly and comment at length. Seems to me the most likely reason is that they are paid to do so. Especially when they advocate for one company at length. Great point. But you really have to stop talking as if only one side of the blind fanboy nation are at fault, all these blind fanboys are equally annoying and stupid. Question is, are you one? No phone is perfect. IPhone 7plus lags and stutters at some point. Which is dissapointing for me as this site claims otherwise. The best reviews should be based on months use of the phone, not days or weeks. iPhone 7 doesn't have a lag issue. If you have saved $1 for every time you have written 'lag' on phonearena.com, you would have saved more than a million dollar. Is it some kind of kick for you to write lag and samsung in the same sentence every time? Even if s8, note 7 lags as you say, they are still very good smartphones. If an iphone user can live with retina display in 2017, a Samsung user can also live with occasional stutter. It's not occasional stutter. It's consistent stutter lol. Yes. Just like iphone is consistently boring, samsung also consistently stutter. Now go out and live your life. The iPhone is boring to me as well, which is why I don't use one in my device rotation. Doesn't change the fact I'd like Samsung to improve its lag/stutter situation. We are both on a mobile tech blog right? Nothing about this suggests we aren't living our lives lol. You are definitely living you life but you are too much obsessed about samsung's lag. Don't you get bored writing same point again and again? Considering the fact you are nexus user, you shouldn't be worried about samsung's device so much. If in the future samsung can fix its ' tremendously lagging devices' you can switch from nexus and buy a samsung device. But writing same thing on phonearena.com every other day, will not help you or samsung or anyone. That is why i said get some life and stop worrying about samsung's lag so much. Dude, objects - such as phones - are boring, go hang out with other human beings if you want to have fun.